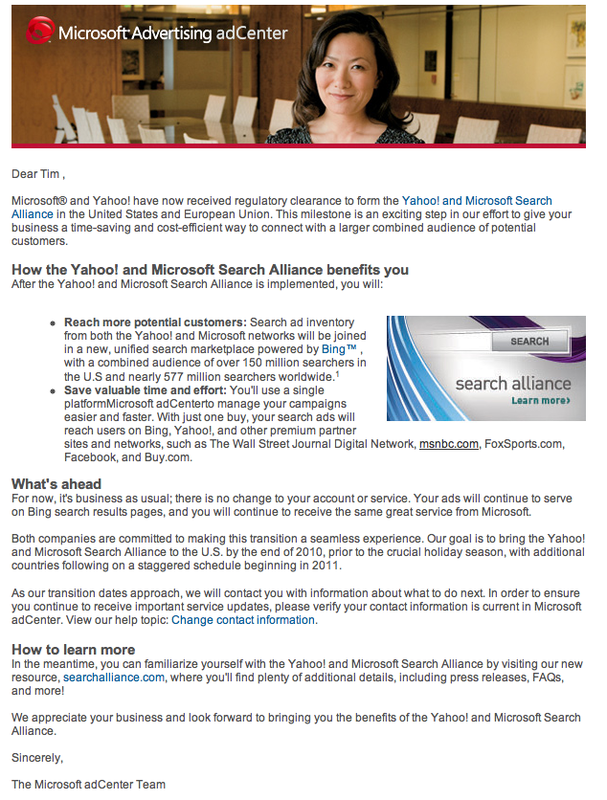 I received the following email today from Microsoft regarding their “search alliance” with Yahoo. Save valuable time and effort: You’ll use a single platform Microsoft adCenter to manage your campaigns easier and faster. With just one buy, your search ads will reach users on Bing, Yahoo!, and other premium partner sites and networks, such as The Wall Street Journal Digital Network, msnbc.com, FoxSports.com, Facebook, and Buy.com. What’s ahead For now, it’s business as usual; there is no change to your account or service. Your ads will continue to serve on Bing search results pages, and you will continue to receive the same great service from Microsoft. How to learn more In the meantime, you can familiarize yourself with the Yahoo! and Microsoft Search Alliance by visiting our new resource, searchalliance.com, where you’ll find plenty of additional details, including press releases, FAQs, and more!